Baltimore Group supports fundraiser walk to honor colleague’s fight with Cystic Fibrosis. There’s a distinct measure of pride in Jeff A.’s voice when he recounts the many different charities that benefit from the support of the Baltimore operational group. The short list includes: American Heart Association, Leukemia & Lymphoma Society, Susan G. Komen Race for the Cure, Ovarian & Cervical Cancer Research, Baltimore Parks & People and Voices For Children. 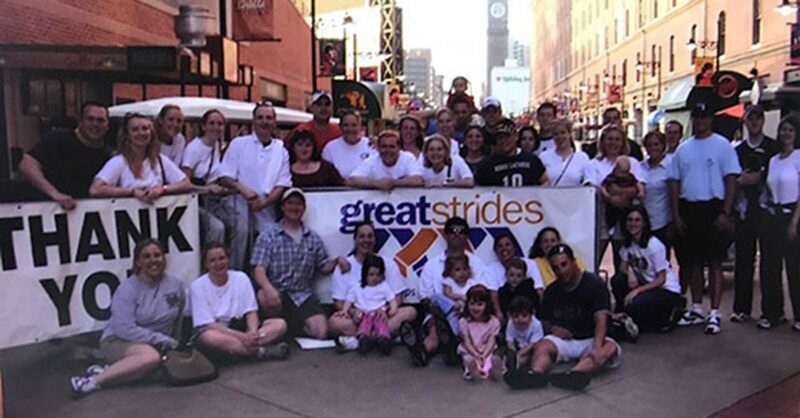 Few ties are stronger, though, than the one the group maintains with the Maryland chapter of the Cystic Fibrosis Foundation (CFF) and the Great Strides Walk in Baltimore – one of CFF’s primary fundraisers. “We walk to honor our colleague, Beth,” Jeff says. As Group HR Manager, he remembers Beth T. well. In her 13-year career at Enterprise, Beth left a lasting impression on her colleagues with her strength, optimistic spirit and good humor as she battled the debilitating lung disease. In 2005, Beth lost her battle with cystic fibrosis. While her determination inspired co-workers, it’s safe to say Beth drew strength from her colleagues too. The same spirit of giving back is still at work in Baltimore today. While still supporting CFF with annual grant requests, the employees have expanded their community involvement to include many other worthy causes.